When it comes to one’s health, we can all agree that no compromises should be made. Healthy living is the most crucial part of our daily lives. You can clobber 80 years in a country where the life expectancy is marked at 60 years. You can walk upright, bend at 90-degrees without any back pain and do a lot more at 70-years. But you can only achieve that by living a healthy lifestyle. There is no doubt that living healthy encompasses a lot of other aspects. Our diets define us in more ways than we can imagine. People will say that healthy smoothies are worth more than a pie of pizza. It is true that anything natural and green is healthier than anything processed or fried. This is why healthy smoothies makes an invaluable asset to healthy living. When it comes to what food to eat and which ones to avoid, your body’s digestion plays a significant role in this decision. You cannot eat something your body is not good at digesting. Furthermore, some foods tend to cause allergic reactions in the body. Probably you’ve heard people say that too much protein causes them rashes. While in other individuals, too many carbohydrates cause blotting. Therefore, it is important to evaluate your digestive system’s abilities. Our take today is in smoothies. Smoothies are some of the healthiest foods that a person can consume. It is rare to hear about allergic reactions due to smoothie consumption. Additionally, people with chronic medical conditions such as the people with diabetes can find smoothies quite friendly to their body. Smoothies are a favorite of many and not just the vegans but everyone else. While smoothies are great for our body due to their nutritional value, not all are equal in value. Some smoothies are more nutritious than others. Some taste sweeter than others. In addition, it is worth mentioning that not all smoothies can stay fresher for longer. Due to the reasons above, we must, therefore, come up with a list of healthy smoothies that strike a balance in all aspects. In a short while, we shall look at some of the best healthy smoothies of all times. Smoothies can be taken not only for satiety alone but also for their health value as well. But before we look into that, when do you think is the appropriate time to take a smoothie? Most smoothies are made from fruits and vegetables. As such, I would recommend taking a smoothie before in the morning, before the main meal, as afternoon refreshment or as a dessert. The reason for taking smoothies as a stand-alone diet is to give the body sufficient time to digest the contents of the smoothie. This will make it possible for all the nutrients to be absorbed into the bloodstream before you take another meal. So make sure to blend some smoothie in the morning and carry some in a water bottle to refresh yourself with in between work breaks. You will stay energized for longer and will be satiated for longer as well. Our list of smoothies will include some homemade and store-bought smoothies. Homemade smoothies are great especially if you would like to add a few extra personal ingredients to the blend. Store-bought smoothies, on the other hand, can come in handy if you do not have enough time to blend some fruits and veggies. Store-bought smoothies are also preferable if you want to know the exact nutritional value contained in the smoothies. For those of us who are too busy to make some smoothies of our own, the Paleta Magic Milkshake is a real deal. This smoothie is a favorite of most workaholics due to its energy enriching qualities. If you are also looking for a healthy smoothie that has a perfect blend of a variety of flavors, then try this store-bought smoothie milkshake. 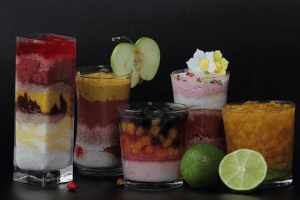 The Paleta Magic milkshake combines different flavors in precise proportions to bring out an amazing taste of nutrient rich, healthy smoothies. Pumpkin pie and chocolate hazelnuts are just but some of the flavors you will find in this magic milkshake. The Paleta Pumpkin healthy smoothie provides you with 200 calories and only contains 11g of sugar. This makes it even ideal for the diabetics. The smoothie has 23g of carbs, so you do not have to worry about bloating. You can find the Paleta Magic Milkshake at affordable prices from various stores and restaurants. This magic health oasis is a must try smoothie if you are attempting to reach some milestone old age years. The ‘white’ healthy smoothies are a blend of frozen ripe bananas, pears, coconut milk, and yogurt. In other words, it is an everything white smoothie. You could decide that you want some additional sweetness from your white super creamy smoothie. Well, in that case, sugar is out of the question, so we go for the next healthy ingredient, honey! Honey not only adds taste but it also enhances the health value of your white smoothie. Try out the white smoothie for healthy living. Remember to add some flax or chia seeds for extra omega fatty acids. One of my favorite smoothies is the ‘red’ smoothie. This great smoothie can be prepared by blending apples, beetroot, and carrots. I would highly recommend this smoothie to anyone looking to survive on healthy smoothies. The apple, beet and carrot smoothie is rich in antioxidants, nutrients, and fiber. Antioxidants have a wide spectrum of benefits varying from relieving inflammation to remedying cancer. Fiber, on the other hand, boosts your digestion and prevents bloating. The ‘red’ smoothie is a healthy diet for your heart, liver as well as your skin. Ensure to get a cup of this healthy smoothie every day when you wake up. This healthy smoothie contains 12g of proteins. It is blended from raw hemp seeds, vanilla, dates and filtered water. For an additional boost, you can drop into the blender protein powder, and some nuts can also help to add some weight loss properties to your smoothie. This is another great store-bought smoothie that packed full of nutrients. The Tio Gazpacho is a veggies smoothie which combines spinach, avocado, mint, and kale. Chilled vegetable smoothies are hard to find. Moreover, most of us do not know how to blend vegetable smoothies. In other cases, our blenders are not suitable for blending vegetable with the consistency required. This is why the Tio Gazpacho vegetable smoothie comes highly recommended. Get 100 calories, 3g of fiber, and 2g of protein and 6g of sugar from this amazing smoothie. The ‘light green’ smoothie is what you need after a bad night. If you are also looking to get back on track nutritionally, the green detox smoothie is a must try. This astonishing health Valley is a combo of spinach, apples, cucumber, parsley, lime, and celery. You will not get any other healthy smoothies so rich with vitamins as this ‘light green’ smoothie. Purify your body with the lime, cucumber, and parsley in your green detox healthy smoothie. Blend a mix of oranges, ripe frozen bananas and Greek yogurt for an extraordinarily tasty smoothie. Add some ginger and honey to it for a higher health value. If you do not have orange juice, simply squeeze one and add the juice to the blend. Get a host of benefits from your ginger and orange smoothie for healthier living. Many dietary plans are difficult to stick to. But did you know, you can longer and healthier by getting a cup of a healthy smoothie daily? Smoothies are very easy to make, you only need a decent blender and the right ingredients. Choose to live healthy by making a healthy smoothie your daily addition to your meals.